This post is part of a quarterly series stemming from our team’s love of growth and learning. 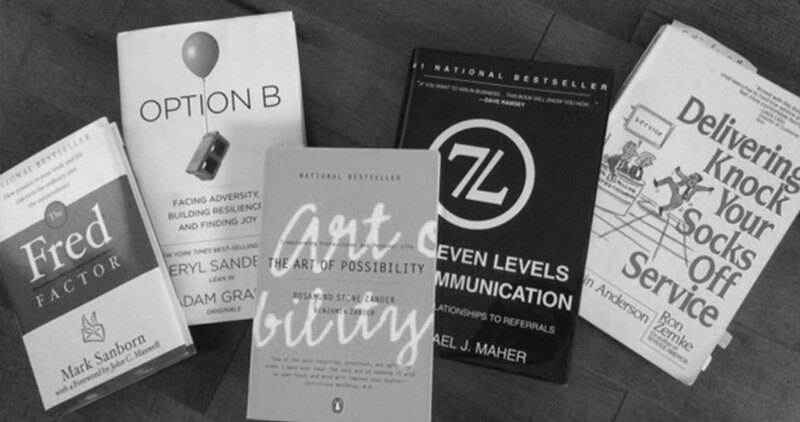 Here we share some worthwhile reads for any clients, partners and friends who are passionate about personal development too! We’re in the final stretch of the year, which means it’s time for our last roundup of good reads! This lineup is chock-full of inspirational stories and practices that will help you close the year out strong. The nutshell: This little book is based on the true story of Fred, a mail carrier who chose to go above and beyond in his work each day. Sanborn shares the way anyone can follow Fred’s example and take what is ordinary and make it extraordinary. Why we love it: It can be easy to dismiss our current circumstances as mundane or not enough. This easy read offers a welcome reminder to see the opportunity waiting in each and every moment. Who it’s for: If you feel that your work is dull or insignificant, pick up this book! It’ll help breathe new life into whatever you do and inspire you to live with greater passion and care. The nutshell: After the devastating and unexpected death of her husband, Sheryl Sandberg, Facebook’s COO, needed to find a way to move forward with life having lost her ideal “Option A.” This book is the product of her journey and shares stories of people who have dealt with a traumatizing event and moved forward with resilience. Why we love it: Life is filled with challenges and traumas — be that unexpected loss or something else. This book accepts the reality of loss and brokenness while also equipping you to move forward in the face of adversity. Who it’s for: Anyone who wants to cultivate a spirit of great resilience can benefit from this one. Whether you need help navigating your own personal struggles or want to be a greater support to someone else, this book is valuable. The nutshell: This book is all about noticing and re-thinking the assumptions we all carry with us — assumptions that have major impacts in our daily lives. It’s guides you to look at all of life through a lens of possibility instead of defaulting to a narrative of struggle (more common in our culture). Why we love it: It’s an incredibly unique read that awakens creativity and compassion. The husband and wife duo brings quite an interesting perspective, pairing his background as a musical conductor with her leadership development experience. Who it’s for: If you feel as though life is all about the struggle and grind, this one has powerful insights for you. If you’re truly open to looking at the world differently, this book has much to offer! The nutshell: In this book, Maher, a highly-referred real estate agent, shares powerful strategies to develop relationships that increase referrals. He drives his points home through a parable about a real estate agent looking to build his business in a down market. Why we love it: This book is a total gem for those in sales and business. The principles Maher shares are spot on. He shows you how to move from relationships to referrals in practical and powerful ways. Who it’s for: Given that the book is written by and about a real estate agent, it’s of course great for those in the industry. And, applications for other fields are plentiful too. Anyone building a business, who wants to learn to connect better with others, will get much out of this one. Delivering Knock Your Socks Off Service by Performance Research Associates, Inc. The nutshell: This one provides a solid overview of customer service — walking through the fundamentals and how-to’s of providing exceptional service. Why we love it: Customer service is, of course, a huge aspect of our company. We’re constantly learning and growing, and this book continually serves as a key resource for our team’s development. Who it’s for: Anyone who plays a role in serving customers in any way can benefit from this book. It’s broken into easily-digestible sections, so you can consume at your pace and apply to your work — whatever that may be!